That looks so incredibly decadent! Another luscious dish.. 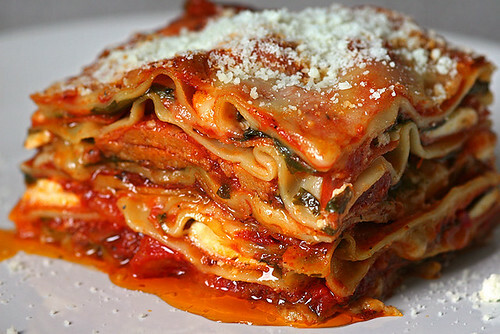 I love lasagne, your noodles are so thin and delicate… is there a certain brand you like? Chris, is the 1 cup of EVOO correct? That seems like a lot! Cathy, I just said 1 cup to make sure you have enough. You may not have to use all of it. BTW, I just tried this recipe again with Newman’s Own Organic Sausage & Peppers Sauce. Outstanding. Now, I didn’t have to add the extra sausages. Let me know how you like yours. Oh, your lasagna looks fantastic!